Politicans around the world associate themselves with popular sports, but in South America the relationship between politicians and football has often been much stronger than that. 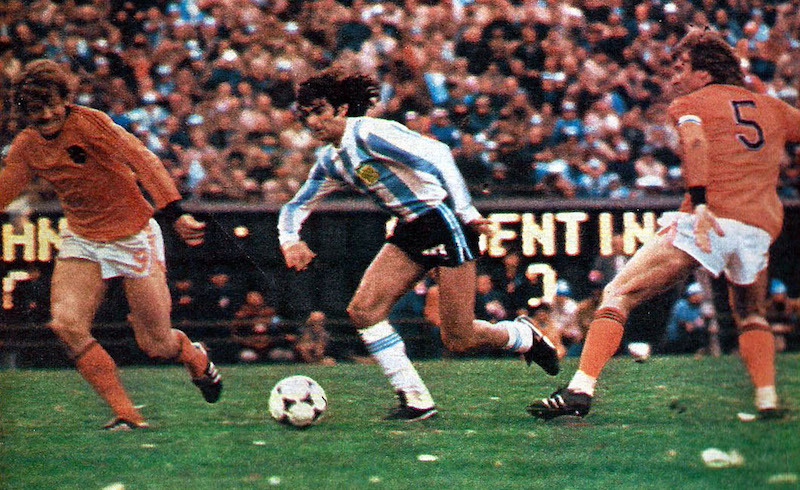 Argentina's Mario Kempes at the 1978 World Cup. Published in 1995 as part of Verso's series of Critical Studies in Latin American and Iberian Culture, Tony Mason's Passion of the People? Football in South America examines the centrality of the game to cultural life in Brazil, Argentina, and Uruguay over the course of the twentieth century. In the excerpt below, Mason reviews the points of contact between professional football and the state, with a particular emphasis on Argentina and Brazil. When reigning monarchs and republican presidents patronize football they are both acknowledging its cultural importance in their society and adding to it. They are both offering support to football and displaying their own authority as they present the cup to the winning team. Moreover they are associating themselves with a popular activity and showing that they too share the passions of their people. But in South America the relationship between politicians and football has often been much stronger than that. Military governments in particular have employed a well-tried mixture of repression, bread and circuses in order to control their peoples, and football has played a leading role in the circus. Several writers have agreed with Uruguayan novelist Mario Benedetti, who pointed to the use of football as political soporific. In such regimes there is growing evidence that leading members of the world of football have been important political figures. What follows will be an attempt to explore the developing relationship between football and governments in twentieth-century South America. The state began to encourage football in other ways. In 1906 the President of Brazil offered a cup for competition between state teams, an early attempt to establish a national championship. The Argentine Congress had promised, and apparently voted money to provide, a trophy to be competed for annually by Argentine clubs, but somewhat mysteriously it failed to materialize.The Ministry of Education did put up a cup to be played for by Argentina and Uruguay in 1908 and a number of matches were played between that time and 1919. In 1911 the Uruguayan Minister of Education reciprocated, the last game in that series taking place in 1923. We have already noticed how, as football grew in importance, it began to play a part in national patriotic celebrations. In 1910 and 1916, for example, football tournaments were part of the centenary festivities in Argentina. The South American championships played a similar role in Brazil in 1922 and the first World Cup in Uruguay was arranged in 1930 to coincide with the centenary of that country's independence from Spain. The President of Uruguay attended all of his country's matches in that first world championship. It was clearly no coincidence that both River Plate in 1938, and Boca Juniors in 1940, opened their new stadiums on Independence Day, 25 May. Leading politicians wanted to be associated with what was fast becoming a major cultural phenomenon. So in 1919 President Pessoa, in the midst of the serious economic and political crisis of that dramatic year, went out of his way to congratulate the Brazilian team which in May won the South American championship for the first time. "I salute in the name of the nation the victory of the young Brazilian sportsmen." President Washington Luis was among the crowd at the opening of Vasco da Gama's new stadium in April 1927. He was there again seven months later for the final of the Brazilian championship between teams representing the old rivals of Rio and São Paulo. Before the game the President and his Ministers received an ovation lasting three minutes from the 50,000-strong crowd. The President later said he had never been applauded by so many people in his life. But his day began to go downhill from that moment. The match was a tight one and was still level at 1-1 with twelve minutes left. The home team was then awarded a penalty. The Paulistas, nonplussed, refused to continue. Up in the stands, the President of the Republic, himself a native of São Paulo, sent down one of his minions to tell the São Paulo players that they should get on with it. The captain of the Paulistas allegedly said that he gave the orders on the pitch and the team walked off. The referee insisted the penalty be taken even though there was no goalkeeper to oppose it and Rio were declared the winners. The press had a field day and it is hard to escape the view that the image of the President was damaged. Just because you are the President it does not give you the right to intervene in football matches. Three years later he was to be ousted by a military coup, but before he went he showed that he was still interested in the part football could play in promoting Brazilian identity at home and abroad when his government provided the CBD with a special budget to organize the participation of Brazil in the first World Cup. The Brazilian Government was to take more interest in football during the Presidency and then the dictatorship of Getúlio Vargas, who dominated the politics of the country for the best part of the quarter of a century after 1930. His coming to power marked the end of the supremacy of the coffee interests of São Paulo, and his regime eventually was able to redirect the economy away from the unpredictable fluctuations of a coffee exporting base through a state-guided programme of industrial development. These economic changes were accompanied by political ones aimed at reducing the power of the separate states and making Brazil more centralized. By the late 1930s Vargas was a dictator, with civil rights curtailed, the press censored, political parties banned and restraints on the activities of the police lifted. Attempts were made to promote feelings of national pride in Brazil. Every radio station had a compulsory Brazilian hour. The regime was also keen to encourage sport and especially football. In April 1941 a National Council of Sports was set up within the Ministry of Education and Culture, its five members, one from the army, one from the air force plus three civilians, all chosen directly by President Vargas. The Vargas era was a turning point in the relationship between football and politics. From this time not only the Federal Government but individual politicians would try to associate themselves with what was becoming an increasingly powerful manifestation of Brazilian popular culture. Not only did the leading football clubs offer social facilities in a country where such things were scarce: the success of Brazilian football abroad, both at club and international level, illuminated the name of Brazil for the rest of the world to see. I feel profound happiness at seeing the joy of our people in this highest form of patriotism. I identify this victory won in the brotherhood of good sportsmanship with the rise of faith in our fight for national development. I identify the success of our [national team] with ... intelligence and bravery, perseverance and serenity in our technical ability, in physical preparation and moral being. Above all, our players won because they know how to ... play for the collective good. The marching tune written to inspire the World Cup team, "Forward Brazil," became the theme song of the regime. The nationalistic slogan "no one will hold Brazil back now" was combined on posters with a picture of Pelé leaping with excitement after one of the goals. The team's first stop after the Mexico victory was Brasilia to meet the President, who had declared the day of the team's return a national holiday. Photographs of Medici with the team were in all the newspapers. He then took the unprecedented step of opening the doors of the presidential palace to the public. Only one year before, the government had created a lottery based on the national game. It became a very successful promotion of the Department of Finance. Not only did it provide revenue, which was divided between the Departments of Social Security and Education and Culture, but it also penetrated to most corners of this vast country and provided a football-based geography lesson for punters. The lottery almost certainly contributed to the pressure placed on the Brazilian football authorities to organize a genuine national championship. As we have seen, the national championship had been a competition between teams representing individual states. A Rio-São Paulo club tournament had been in existence since 1950 and was expanded in 1967 to include clubs from the other three southern states. Air travel made a national championship for clubs possible especially if the government was prepared to contribute to the cost of the fares. By 1979 ninety-two teams from twenty-two states were involved in a championship which was added on to the state league's season, making football an all-the-year-round business. Both the travel and the playing exhausts the teams and a plethora of games, many of them between teams of grossly unequal strengths, deters the supporters. Critics have claimed that the development of Brazilian football has been distorted by politics. So far as the military regime was concerned a national championship, like a national lottery, contributed to the overall strategy of national integration. Having at first banned political parties, they then reinvented them, creating a majority government party and a minority opposition one. As winning elections became more difficult, football in general and a place in the national championships in particular, was used in an attempt to sway the electorate. This was made easier by the fact that the Presidency of the government ARENA party in Rio and the Presidency of the CBD were both in the hands of Admiral Hélio Nunes from 1974. Opponents claimed that in areas where ARENA was doing badly the local teams would be given a place in the national championship even if they had not earned one by success on the field. Politics and football remain closely related in Brazil, perhaps one reason why this ludicrously overgrown national championship continued even after democracy was restored in 1985. It is hardly in the interests of the players, and although there are many reasons why they so often follow the siren call of Europe, notably money, the physical and social pressures of too many matches must also play a part in the decision to go. Leading football personalities know that being a football person helps if you want to go into politics in Brazil and if you are a politician an interest in football is a real advantage. It has been suggested already that there was clear contact between the worlds of football and politics in Argentina. The nation's President was involved in the unification of the two organizations running the game in 1926. It was to the President that a deputation of striking players went in 1931. The nation's leader was also present when Boca Juniors opened their new ground on 6 July 1924, accompanying his Minister of War, Agustín P. Justo, who was a big fan of the club. General Justo would be President of the Republic himself between 1932 and 1938. The President of Boca 1939–46, Eduard Sáncez Terrero, married Justo's daughter. It is not surprising that Boca and River had financial help from the state to develop their stadiums. A study of AFA Presidents has clearly shown how the spheres of football and politics overlapped. Aldo Cantoni, for example, was President of the Asociación Argentina de Football in 1922–23 and 1926. He was President of Huracán between 1920 and 1923 and again in 1933–4 and also Governor and national senator for the province of San Juan. Ramón Castillo was President of the AFA between 1941 and 1943. He had had no role in football until then but he was the son of the country's President ... This relationship between football and politics would be made more systematic under President Perón. Perón was a colonel in the army who quickly became an important figure in the military government which seized power in 1943. He was both Minister of War and head of the Department of Labour and Social Welfare. Far from declaring war on labour he promoted the expansion of trade unions in Argentina to such effect that within two years their proportion of the occupied workforce rose from 10 per cent to 66 per cent. In 1945 Perón married the actress María Eva Duarte and in 1946 stood for the Presidency and won. With the support of the unions and the urban middle class Perón created a powerful political organization. He introduced measures to redistribute income in favour of workers and nationalized foreign-owned public utilities like the railways. It was a nationalist impulse that was behind his drive for state-led industrialization in order to reduce Argentine dependence on imports and on the export of food and raw materials. Perón promoted activities designed to further the cultural progress of Argentina and stimulate national unity. Sport in general and football in particular were already popular and it was obvious and easy to use the resources of the state to encourage sport further. Like all governments, he thought such a policy might be a vote winner and take some people's minds off the less satisfactory aspects of his regime. In 1947 the government created a new sports overseer by fusing together the Argentine Olympic Committee and the Confederation of Argentine Sports. The new authority was chaired by the President of the Supreme Court. "Perón sponsors sports" and "Perón, the first sportsman" — echoing the claims made for Mussolini — were slogans designed to draw attention to the way in which sport and sportsmen were to play an important role in constructing the new Argentina "which we all desire." Government funds helped with the preparation of the largest team to have been sent to an Olympic Games up to that point, 1948, and it was delighted to associate itself with their considerable if slightly surprising success. Peronist medals were presented to the athletes in a public ceremony in the stadium of River Plate in 1949. In 1951 Argentina organized and won the first Pan-American games, providing opportunities for the Peronist Government to emphasize the civilized state of Argentine culture and its leadership of "America." Sporting heroes who won famous victories regularly dedicated them to Juan and Eva. Pascual Pérez, the first Argentine boxer to win a world professional title when he defeated Yoshio Shirai in Tokyo in 1954, grabbed the ring microphone at the end of the contest and cried, "Mission accomplished my general! I won for Perón and for my country." Such triumphs were given the maximum publicity in the largely government-controlled newspapers and radio. Eva Perón also promoted sports through the Social Aid Foundation, which she headed. The first of the Evita Championships took place in 1950. It was a football tournament for children aged between thirteen and fifteen. Anyone could form a team, choose a name, choose its colours — the Foundation supplied all the kit — and enter. The finals were played in Buenos Aires by twenty-four teams. Evita kicked off and in addition to the national anthem, a march was played with the chorus, "To Evita we owe our club, and for that we are grateful to her." A total of 150,000 children took part in that first tournament, 200,000 in the second in 1951. The aim was not only to promote participation but also to improve the health of the young. Entry was accompanied by a compulsory medical and an X-ray. The championships were later extended to athletics, basketball, and swimming and were yet another public sign of the new Argentina. It appears fashionable to criticize the scheme for its failure to produce many players who would play in the professional league, but it does seem to have been widely enjoyed for the few years it lasted with many small football enthusiasts putting on their first pairs of boots and socks. Football had many supporters among the Peronist Government, some in influential positions which enabled them to be real benefactors to their favoured clubs. The most famous example was Ramón Cereijo. He was Finance Minister and a passionate supporter of Racing. Though not officially engaged in the management of the club, he was alleged to have taken part in negotiations with other clubs over player transfers. When the best Argentine players were leaving the country for Colombia and Europe during and immediately after the dispute of 1948–9, no one left Racing. The club were champions for three successive seasons, 1949, 1950 and 1951. After the latter triumph most of the team received new Chevrolets. Racing were nicknamed Sportivo (Sporting) Cereijo. As Finance Minister he was central to the cheap loan of three — soon to be eleven — million pesos, which the government advanced to the club so they could build their new ground. It did not need to be repaid for sixty-five years which, given the frequent bouts of inflation, made it a really good deal. No wonder the stadium was named after President Perón, he was given the Presidency of the club, and Eva Perón, Cereijo, Bramuglia (Minister of Foreign Affairs) and Miranda (President of the Central Bank of Argentina) were made honorary members. Both the President and the first lady turned up for the inauguration on 3 September 1950. Few clubs were without a state godfather, although it would be tedious to list them. Ironically when they did venture outside the River Plate Argentina had victories over Eire (1951), Spain, and Portugal (1952). In fact the only defeat inflicted on Argentina between 20 December 1945 and 5 December 1954 — excepting an unofficial match against Uruguay during the dispute of 1948 — was by England at Wembley in a friendly arranged as part of the Festival of Britain celebrations in May 1951. This was the first ever meeting between the two countries and one can imagine that it meant a lot to the visitors. The British had introduced football to Argentina and done much to develop it. In spite of setbacks, the myth of their superiority, as is the way with myths, was reluctant to fade away. England boasted an unbeaten home record against foreigners, with the exception of Eire. The immediate political background was not without tension either as Argentina and Britain had just spent the best part of a year renegotiating their 1949 trade agreement. In general the new terms were more favourable to Argentina but an important result was a small increase in the British meat ration. The match provoked a good deal of interest and a record crowd for an international match played on a midweek afternoon. Argentina scored after eighteen minutes and although mostly on the defensive for the rest of the match were not beaten until England scored two goals in the final eleven minutes. Rugilo, the Vélez Sarsfield goalkeeper, made his name in that match as the "Lion of Wembley" and in spite of the tears from some of the players at the end it had been an honourable defeat. The party actually received a heroes' welcome on their return to Buenos Aires. In 1953 England returned the visit. Argentina had again missed the South American championships played in Peru just a few weeks before. Perhaps they were preparing for something they thought more important. After all, Argentina had won many such titles and would have plenty of opportunities to do so again. But the English were not to be taken lightly. For them the visit was part of a tour which also took in matches against Uruguay, Chile, and the United States and was the first ever visit to South America of the national team. There were to be two games in Buenos Aires. The first, according to the English, was designed to give the reserve players in the party a game. It was not a full international, but was described in English sources as an FA XI against an Argentinian XI. Not surprisingly Argentina picked its best team. England included only four of their first choices and were soundly beaten 3-1. Argentine joy was more or less unconfined. President Perón declared the day of the match, 14 May, to be "Footballers' Day" to be celebrated every year. A few days later the full international was played but had to be abandoned after twenty minutes because the pitch was flooded. There are three further examples of the close links between football and the government of Perón. On the death of Eva Perón in 1952 the AFA and most of its affiliated clubs and leagues sent the most fulsome messages of sympathy to the President. Two years later, in 1954, Alberto Armando of Boca dedicated the championship which they had just won "to the man who has known how to give Argentinian sport the content and vitality with which it finds itself at the moment, with international repercussions which have gained him acknowledgement as first sportsman of the world." Finally the AFA gave funds to the Eva Perón Foundation to benefit the victims of the failed coup of 16 June 1955. Of course the government did not run football. They did not decide every issue. But the AFA was run by the President's men: and, as noted earlier, Valentín Suárez emphasized that the views of the government had to be "respected." The close relationship between football and politics would not end with the overthrow of Perón. Nor would Peronism end with the overthrow of Perón. In 1966 FIFA provisionally named Argentina for the venue of the World Cup of 1978. The selection could hardly have been better timed. In 1966 the eighth world championships were held in England. In the quarter finals Argentina met the hosts. When footballing cultures clash they can do so in fascinatingly fruitful ways or deafeningly negative ones. This game was one of the latter. This is not the moment to do more than mention how the English and the Argentinians saw it. The men from Buenos Aires went in for systematic fouling: no one was allowed to pass them. This was buttressed by continual complaints to, and criticism of, the German referee orchestrated by the captain, Boca midfield player Antonio Ubaldo Rattín. The climax came shortly before half time when the referee lost patience and sent Rattín off. For a while it looked as though the Argentinians would not continue. The stoppage lasted eight minutes. Both at this time and at the end of the match there was more trouble between the Argentine players and the officials. Two Argentine players were later suspended for their part in it, Ferreiro for attacking the referee and Onega for spitting at a FIFA official. In spite of being reduced to ten men, the rest of the team played well enough in a close game which either side could have won. England were very relieved by Hurst's sixty-sixth-minute winning goal. In Argentina the predominant response appears to have been outrage. This was fuelled by the England manager's comment in a post-match interview. "We have still to produce our best football. It will come against the right type of opposition, a team who come to play football and not act as animals." Argentina had been insulted as well as cheated. Argentina was the "moral champion." President General Juan Carlos Onganía greeted the team on their return to Buenos Aires. A popular daily newspaper Crónica published the headline: "First they [the English] stole the Malvinas from us, and now the World Cup." The same newspaper later financed an expedition which landed a small plane on the Falkland Islands. Football remained closely related to the state. Valentín Suárez made it clear enough in January 1967: "The government never closed its doors and never will close its doors on football clubs." With many of the leading clubs in financial difficulties it was just as well. The state loaned millions of pesos to football clubs. In return the championship was restructured from 1967 with the Buenos Aires League becoming the Metropolitan championship and a new National championship extending the season to nine months of the year. As with Brazil, political factors were important. The smaller clubs and the provinces of the interior wanted their share of the national obsession. Some Argentines have suggested that football had become a kind of public service. It was inevitable that the 1978 World Cup would be conscripted. FIFA had confirmed in 1975 that Argentina would be the venue for the next world championships. Little appears to have been done by a Peronist Government overwhelmed by inflation and apparently on the brink of civil war. The government was overthrown by the military in March 1976 with a three-man junta led by General Jorge Videla as President. Some members of the new government suggested the country could not afford to stage the World Cup, but the junta disagreed. In July 1976 the World Cup was declared a national interest and an organizing committee set up. EAM78 — Ente Autárquico Mundial '78 — got off to a bad start when its first President, General Actis, was assassinated. But a lot of hard work and the spending of some 10 per cent of the national budget of Argentina for 1978, 700 million US dollars, produced remodelled stadiums at River Plate, Vélez Sarsfield, and Rosario and new ones in the provincial cities of Córdoba, Mar del Plata, and Mendoza. A new press centre for the two and a half thousand journalists expected was also constructed, together with new television studios and the introduction of colour TV, a FIFA requirement for the billion people who would watch the games from their own homes. 26 Airports were improved and Buenos Aires smartened up. The organizers claimed that some of this outlay would be recouped by 50,000 tourists, but no more than 10,000 eventually arrived. For those on the outside, for all the journalists, the insidious and badly intentioned journalists who for months have been organizing a campaign of lies about Argentina this tournament is showing the world the reality of our country and its capacity to do things with responsibility and to do important things well. For those inside, for those who do not believe that we have in our own house ... after so many hard experiences ... enormous possibilities and this has nothing to do with the football results. Argentina has already won the World Cup. Videla called it a "World Cup of Peace" — he got an ovation for that one — and the goals of improving Argentina's international image and repairing the fractured national consensus appeared to have been achieved. But the enthusiasm with which Argentina overflowed for the World Cup of 1978 was not simply produced by the promotional activities of the dictatorship. It was, as the title of a feature film by Sergio Renán had it, La fiesta de todos — Everybody's Feast. There were echoes of 1930, with firms placing television sets in factories and offices, families fitting their lifestyles around the football schedules, cinemas changing their programmes and newspapers publishing special supplements. Every time Argentina played there were huge celebrations in Buenos Aires and the cities of the interior. When Peru were beaten 6-0 and Argentina's place in the final was assured it was estimated that 60 per cent of the population of Buenos Aires went on to the streets to celebrate. Only the Brazilians and Alemann, the Minister of the Interior who had been critical of the cost, were suspicious. The Brazilians, because FIFA had foolishly allowed their game with Poland to be played before Argentina met Peru, which meant, as Argentina and Brazil would have equal points if both won, that Argentina would know exactly how many goals were required to win their place in the final. Alemann, because a bomb exploded at his home at the precise moment when the all-important fourth goal was scored. After victory in the final against the slightly unfortunate Dutch, parties went on all through the night of 25 June and the next day the Plaza de Mayo was thronged with schoolchildren who were greeted by President Videla. All the population without exception offered its happiness, its legitimate fervour, showing itself to be hospitable friends of visitors and these people will be the witnesses of our true reality in their own countries without the defamation of this international campaign of falsehoods. The sport was an opportunity, the way to express, as never before, the feeling of national unity and the common hope of peace, unity and fraternity. But the people too had been in thrall. While it lasted it was something to share and something to savour. It was a breathing space between a horrific immediate past and an anxiously uncertain future. On the first anniversary of the victory of Argentina over Holland the newspaper Clarín organized a great celebration in the River Plate stadium in the presence of the President. In September of the same year, the occasion of the victory of Argentina in the World Youth Cup held in Japan was used to obstruct the work of a committee from the Organization of American States which was investigating violations of human rights. A well-known radio commentator, José María Muñoz, told his listeners to go to the Plaza de Mayo and show the people of the human rights commission that Argentina had nothing to hide. The Plaza de Mayo was the scene of the silent protest by mothers drawing attention to the fact that sons and daughters had disappeared. This attempt to exploit the enthusiasm of football fans against the mothers appears to have backfired, as both members of the commission and the public had the issue placed powerfully in front of them. The euphoria produced by the 1978 World Cup was not simply the result of government power and in particular its control of newspapers, radio and television. Neither was the enthusiasm shown in the first days of the Falklands War in 1982. But the connection between football, war, and politics was close. The chants of the crowds in the streets were from the stadiums. In the final of 1978 they had chanted "he who does not jump is a Dutchman"; in 1982 he was an Englishman. "Ar-gen-ti-na, Ar-gen-tina" was used in 1982 to support the armed forces in their big match. Leaflets showing the 1978 World Cup emblem, a very young gaucho dressed in football kit accepting the surrender of a defeated British lion, were widely distributed. Official television coverage of the war was shared with football matches. When Argentina played, the games were clothed in patriotic sentiment. The national anthem, a minute's silence for the Argentine dead, followed by flag waving and chants of "Ar-gen-ti-na." Before the end of that war the military dictatorship decided that Argentina would play in the World Cup in Spain. "The Army of the Andes in shorts," as one Peronist intellectual labelled them, lost to Belgium just one day before the military surrender in the Falklands. The second stage of the competition was reached but there followed comprehensive defeats by Italy and Brazil and elimination. In the match against Brazil the new hero of Argentine football, Diego Maradona, was sent off. The military men wanted to use the Mundial but they also wanted us to come out champions. Many Argentines who celebrated did not like the military, but we also wanted to be champions. What could we do? Not dance? Boycott the Mundial? Do dictatorships pass away, do Cups remain? We went, we won and we danced. Such a response was very different from those who accosted the mothers of the Plaza de Mayo, mourning for their "disappeared" children, and accused them of damaging their country. If all Argentines supported the "great party" they did not do so for the same reasons. But in the end all this investment in the World Cup could only purchase a breathing space for the government. Football victories, even in World Cups, do not solve economic, political, and social problems. The national euphoria produced by hosting the World Cup was repeated during the early days of the Malvinas/Falklands war in 1982. But again some of the support had complex roots. As in Britain, where groups who detested the Thatcher Government supported a military response to the occupation because they identified the Argentine military government with fascism, so in Argentina there were those who opposed the military regime but were persuaded that the British were imperialists fighting a colonial war. Defeat in the World Cup would not have been the epilogue for the Argentinian military dictatorship. Defeat in the Malvinas/Falklands was. Football is a political temptation, especially to Argentine nationalists. A group of Peronist Senators demanded that President Alfonsín order the Argentine team not to play against England in the World Cup quarter final of 1986. Two years later Argentine supporters of Newells Old Boys, in Montevideo for the first leg of the Libertadores Cup Final against Nacional, unfurled Peronista banners but put them away after the second Nacional goal. President Menem even donned the Argentine jersey and played a full ninety minutes with the national team in 1989. He once told a British television crew, "football is the thing that formed me physically and it has given me a great deal of spirituality" and that as a child he had dreamt of playing for Argentina. Football as political diversion is an old story in South America and by no means restricted to Argentina and Brazil. In La Paz in 1968, for example, the government attempted to distract the workers summoned to march on May Day to protest against low wages and anti-trade union measures by arranging the visit of a leading Argentine team. Televised football was often used to keep people indoors on that dangerous holiday. This was particularly so during the years of General Onganía's rule in Argentina 1966–70, where up to six live matches a week were being shown and the clubs compensated as attendances slumped. Dictators prevented leading clubs from feeling the full impact of their own mismanagement. General Pinochet rescued Everton of Viña del Mar in 1979 and the Rangers club of Talen in 1982 as well as nominating the President of the country's leading club, Colo Colo of Santiago, in 1981 and 1984. He did not want a collapse of Chile's professional league. Similarly the regime of General Stroessner in Paraguay saved two Asunción clubs, Sol de América and Cerro Porteño, when they got into financial difficulties in 1983 and 1985. The military junta in Uruguay did the same for Peñarol in 1978 and 1981. In both countries state funds were used to support the national team: in Uruguay, by organizing a tournament for World Cup winners at the end of 1980 and in the New Year of 1981; in Paraguay by spending one million US dollars on preparing Paraguay for the 1986 World Cup. There have often been rumours that exceptional players were prevented from going abroad by mysterious deals. Is it true or an urban myth that the President of Santos, Athie Coury, who was also a deputy for the state of São Paulo, was warned in 1960 that if Pelé left the club he need not bother to stand for re-election, indeed should start counting the days of his life? Who was Eduardo António Coelho, alleged to have given Santos an interest-free loan of half a million US dollars to keep Pelé? It does seem clear that after the collapse of military dictatorships in the mid 1980s it has become more difficult for clubs to resist offers from Europe for their best players. It is repression or the fear of it which keeps people politically passive in dictatorships, but football, like the television soap opera, plays a part.